Dr. Gouldner observed changes in the American occupational structure that he thought were altering the balance of power among social classes. As he saw it, beginning in the early 20th century, increasing complexity in science, technology, economic affairs and government meant that the “old” moneyed class no longer had the expertise to directly manage the work process or steer the ship of state. Members of the old class turned to scientists, engineers, managers, human relations specialists, economists and other professionals for help. As these experts multiplied, they realized the extent of their collective power. They demanded fitting levels of pay and status and insisted on professional autonomy. A “new class” was born, neither owner nor worker. A distinguishing feature of this new class, according to Dr. Gouldner, was the way it spoke and argued. Steeped in science and expert knowledge, it embraced a “culture of critical discourse.” Evidence and logic were valued; appeals to traditional sources of authority were not. Members of the new class raised their children in such a culture. And it was these children, allergic to authoritarian values, who as young adults were at the center of the student revolts, finding common ground with disaffected “humanistic” intellectuals bent on changing the world. This ties in with our current emphasis on the white working class, whose numbers are actually diminishing as this new class grows. 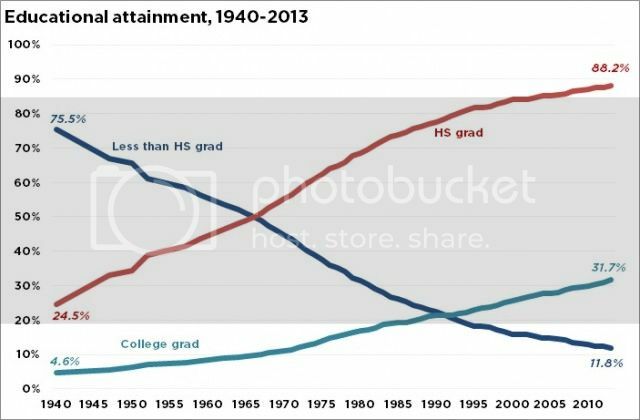 That was demonstrated not long ago by this chart Paul Waldman made of how education levels in the United States have changed dramatically over the last 75 years. The point Gross makes with all of this is that the “new class” has emerged as decidedly liberal. It is easy to see why with the description up above a reliance on science and expert knowledge as well as critical discourse. But he also points to a couple of other factors. What explains the consolidation of the highly educated into a liberal bloc? The growing number of women with advanced degrees is part of it, as well-educated women tend to be especially left-leaning. Equally important is the Republican Party’s move to the right since the 1980s — at odds with the social liberalism that has long characterized the well educated — alongside the perception that conservatives are anti-intellectual, hostile to science and at war with the university. A look at the issues that are taking center stage in the Democratic Party indicates the influence this new class has on the left. It is no accident that access to affordable college is front and center these days. And the fact that the Party has adopted a feminist agenda should come as no surprise either. Right now the way that Donald Trump has captured the support of the Republican base is getting all the headlines. That fits with the old adage about the squeaky wheel getting the grease. But I suspect that this new class will have their say before this election is over – it just won’t be as loud and obnoxious.